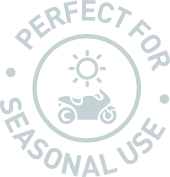 Up to 80% lighter than lead-acid batteries for the ultimate riding experience. No acid inside, comes ready to be installed. 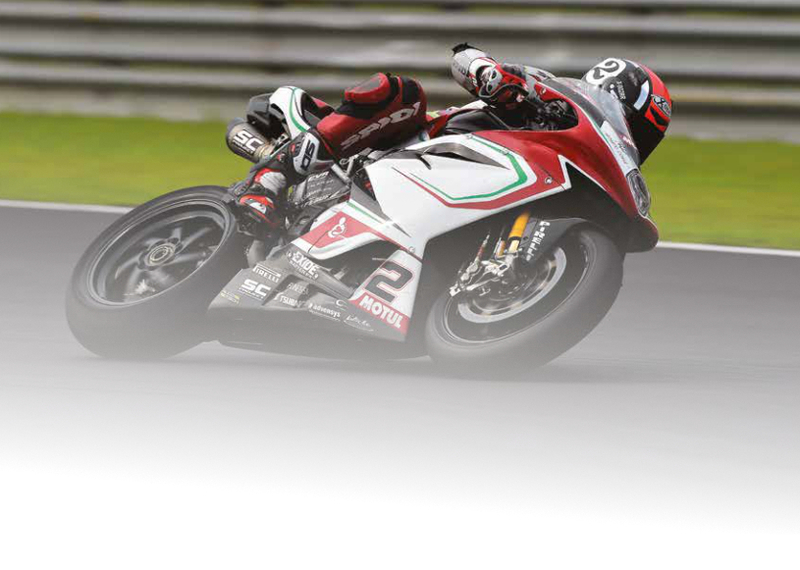 Exide is speeding up your passion. It has launched a new lithium-ion Motorbike & Sport battery range for those who demand the ultimate riding experience. The battery’s ultra-lightweight design reduces the overall weight of your bike, enabling faster acceleration and better performance. It has very low self-discharge, ideal for starting your engine after long periods off the road. Exide Li-ion can be installed in multiple positions and comes with first-class safety features. Lithium is still a new technology and while they provide a higher starting performace than lead-acid, they lack performance in continous use - i.e. running heated grips, speakers, GPS, exessive lights etc. In addition to this, lithium batteries must be charged by a lithium charger. Please be sure to bear these points in mind if you plan to upgrade to lithium. Please give us a call if you need to ask any questions as we will be more than happy to be of assistance. Need a Lithium charger? 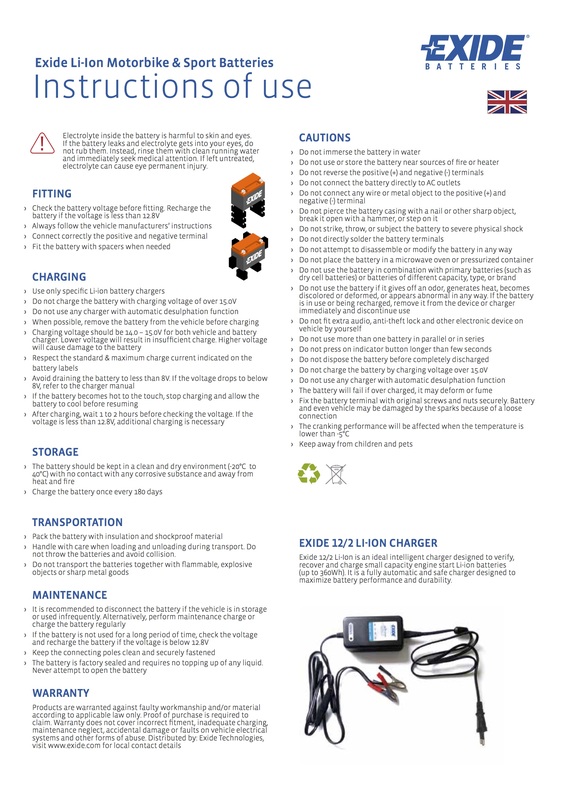 Find the new Exide Li-ion charger by clicking here. A Lithium-ion battery is a rechargeable battery type in which lithium ions move from the negative electrode to the positive electrode during discharge and back when charging. The three primary functional components of a Lithium-ion battery are the positive & negative electrodes and electrolyte. Lithium-ion offers the highest energy storage to smallest weight/volume ratio of any kind of today’s commercially available battery. Very fast recharge and longer life are also very compelling arguments for this battery type. 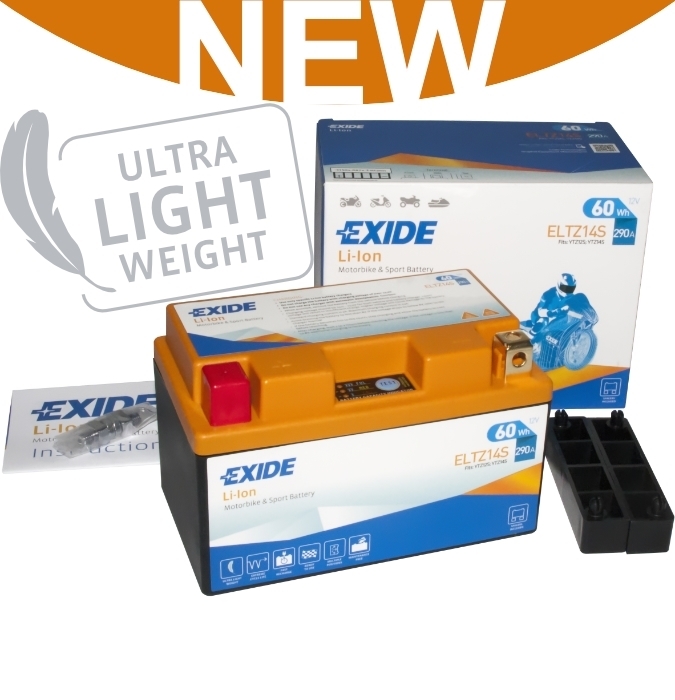 Exide Li-Ion battery uses lithium iron phosphate (or LiFePO4), the best choice for top safety & life span with good power density (CCA).